I am a digital public historian and a program officer. 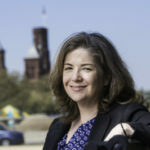 I am the former Director of Strategic Initiatives at the Roy Rosenzweig Center for History and New Media where I also worked as a Research Associate Professor in History and Art History at George Mason University. My newest publication, Stamping American Memory: Collectors, Citizens, and the Post, is available as an open access digital and print monograph from the University of Michigan’s Digital Culture Books series. It offers the first cultural history of stamp collecting through closely examining the Post Office’s commemorative stamp program. Designed to be saved as souvenirs, commemoratives circulated widely and stood as miniature memorials to carefully selected snapshots from the American past that also served the political needs of small interest groups. I began my career working in public museums, and served as the Director of Education and Public Programs at the U.S. Navy Museum in Washington, DC for seven years before I came to RRCHNM in 2005. At the Center, I directed and managed 30+ projects. The first project that I managed and worked on from start to finish was the Hurricane Digital Memory Bank. After HDMB, I became part of the original Omeka team (2007-present), and continued to work on many other digital humanities and cultural heritage projects. I have experience teaching, and leading and developing workshops that introduce digital humanities methods to scholars, GLAM professionals, and graduate students. I received my PhD in American and digital history from Mason, and earned an MA from the University of Notre Dame and BA from Bates College in American Studies. My research interests include public history, digital history, collecting practices, how museums use the web and digital platforms, museums and material culture, memory and memorialization, and US cultural history. I have co-authored essays on teaching the history of technology, doing oral history in the digital age, as well as white papers focused on developing digital public history projects and on increasing digital literacies of mid-career scholars. I have contributed to edited collections, including Debates in Digital Humanities 2016 and two volumes published by Smithsonian Institution Press. My dissertation, “Stamping American Memory: Stamp Collecting in the U.S. 1880s-1930s,” earned the 2010 Moroney Prize for Scholarship in Postal History. In 2012, I was awarded the University of Michigan Press-HASTAC Prize for Digital Humanities to create a new web project, Stamping American Memory, an open peer-reviewed, open access digital book and publication with University of Michigan Press. I present on topics in digital humanities and museums, online collecting, postal history, and digital public history. “A Case for Digital Collections,”Collections: A Journal for Museum and Archives Professionals 12, 4 (Fall 2016). “Public, First,” in Debates in the Digital Humanities 2016, eds. Matthew K. Gold and Lauren Klein (Minneapolis: University of Minnesota Press, 2016), http://dhdebates.gc.cuny.edu/debates/text/83. “Let the Grant Do the Talking,” Journal of Digital Humanities, Vol. 1, No. 4 Fall 2012 http://journalofdigitalhumanities.org/1-4/let-the-grant-do-the-talking-by-sheila-brennan/. “The Vindex Special: Learning about Technology Through Advertising,” Magazine of History, (Winter 1998) with Susan Smulyan and Carlita Kosty. “Oral History in the Digital Age,” Oxford Handbook of Oral History, (New York: Oxford University Press, 2010) with James Halabuk, Sharon Leon, Tom Scheinfeldt, and Kelly Schrum. “Trailblazing: 100 Years of Our National Parks,” exhibition, The Public Historian 38, No 4. (November 2016). “Making Room by Letting Go: A Look at the Ephemerality of Collections,” invited blog post, Preservation Nation, National Preservation Leadership Forum blog, National Trust for Historic Preservation, August 12, 2014 http://blog.preservationleadershipforum.org/2014/08/12/collections-making-room-by-letting-go/. “Outstanding public history project award: Histories of the National Mall,” invited blog post, History@Work, March 18, 2015, http://publichistorycommons.org/award-histories-of-the-national-mall/. Creating Local Linkages: Training Public Librarians to Facilitate Doing Digital Local History,” Primary Investigator and Co-Director, 2017-2020: Grant to develop a free and open online curriculum, and offer in-person workshops, that will train public librarians in doing digital local history. Hearing the Americas: Primary Investigator and Director, 2017-18: Grant to plan a new digital public humanities project on the transnational origins of early American popular music. State of History Museum Websites, Primary Investigator, 2011: Survey and analysis of content from 115 history museum websites and their digital presence. Mobile for Museums, Project Manager, 2008-09: Grant to research and produce a white paper on the state of the field and best practices in mobile technologies for museums, and included building of a prototype mobile website and accompanying Omeka plugins.